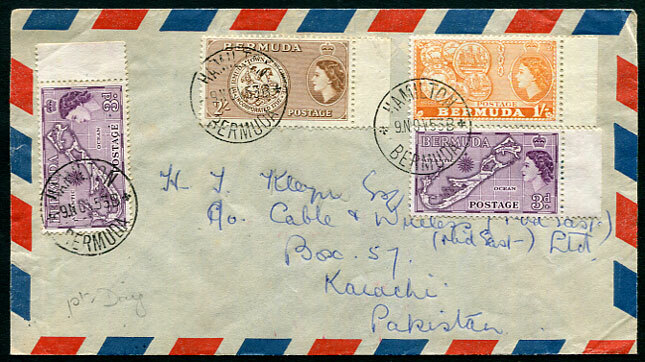 1953 (NO 9) first day QE2 franking pmk'd Hamilton to Karachi, Pakistan, arrival backstamp. 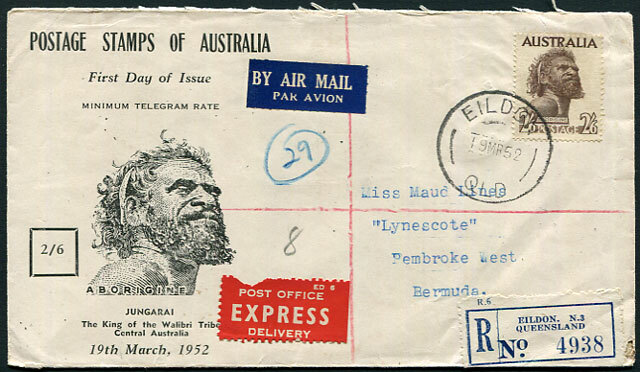 1958 (MY 16) First Day cover for 8d definitive in a strip of three pmk'd Hamilton addressed Cable & Wireless in Muscat, some soiling, Muscat arrival backstamp. FROM AN OFFICE ABOUT TO BOYCOTT THEM! 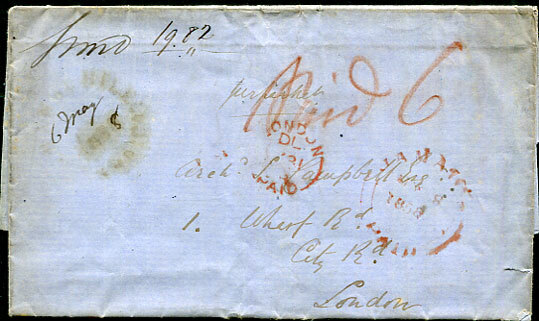 : 1858 entire to Archibald Campbell in London with weakly struck GRANGE-HILL manuscript dated 6 May (185)8 marked "Paid "6" in red crayon showing both red JAMAICA/PAID MY 8 1858 and London Paid MY 31 58 arrival. 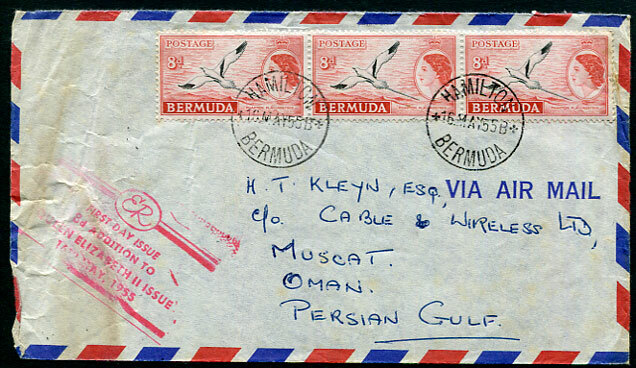 This being a unique "associated first day cover" for the day that GB QV adhesives were placed on sale in Kingston, Jamaica. The GB QV 1d, 4d, 6d arrived on "Solent" MY 6 1858 and were placed on sale at Kingston MY 8 1858. When Grange Hill received its supply of GB adhesives it boycotted their use for some 3 months along with about 30 other offices (Thomas Foster handbook Page 127) as GPO London ruled on April 16 1858 that the PMG's deputies at the Post Towns would receive only 1% commission on sale of the GB stamps whereas they had been receiving 15% commission on prestamp letters prepaid in money.